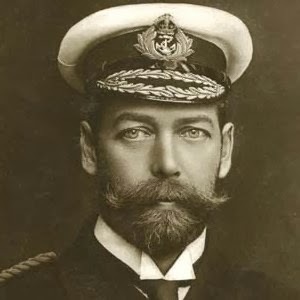 The tradition of a Christmas broadcast by a British monarch began with George V, Queen Elizabeth's grandfather. In 1932, George delivered his first Christmas message by radio. The original idea for a Yuletide speech from the King came from Sir John Reith, founder of the British Broadcasting Company.(BBC). 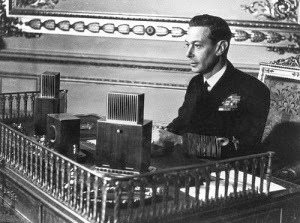 Although George V had reservations about speaking on the relatively new medium of radio, the BBC addressed his misgivings and persuaded him to make the broadcast to inaugurate the Empire Service (now known as BBC World News). A recording of the broadcast was also sold as a 72 rpm. record. On Christmas Day 1932 King George V spoke the following words over the radio, or as the British would say, "the wireless." His message was short, less than 300 words, and it lasted about two-and-a half minutes. It is also important to note that it was written by Rudyard Kipling, famed English short-story author and poet, whom fellow writer George Orwell once described as "a prophet of British imperialism." Through one of the marvels of modern science, I am enabled, this Christmas Day, to speak to all my people throughout the Empire. I take it is a good omen that Wireless should have reached its present perfection at a time when the Empire was linked in closer union, For it offers us immense possibilities to make that union closer still.. It may be that our future will lay upon us more than one stern test. Our past will have taught us how to meet it unshaken. For the present, the work to which we are all equally bound is to arrive at a reasoned tranquility within our borders; to regain prosperity without self-seeking; and to carry with us those whom the burden of past years has disheartened or overborne. My life's aim has been to serve as I might, towards those ends. Your loyalty, your confidence in me, has been my abundant reward. I speak now from my home and from my heart to you all. To men and women so cut off by the snows, the desert or the sea, that only voices out of the air can reach them, to those cut off from fuller life by blindness, sickness, or infirmity; and to those who are celebrating this day with their children and grandchildren. To all - to each - I wish a happy Christmas. God Bless You! George V continued to broadcast his Christmas messages until the end of his reign. He delivered his last speech in December of 1935, about a month before his death on January 20, 1936. In 1937, Queen Elizabeth's father, George VI (who had a speech impediment) delivered his first Christmas message as king, thanking the Empire for its support during the first year of his reign. In 1939, with the outbreak of World War II, George used his Christmas broadcast as a means to offer solace and encouragement. Dressed in his uniform of Admiral of the Fleet, the King reassured his people in a time of uncertainty. He stated, "A new year is at hand. We cannot tell what it will bring. If it brings peace, how thankful we shall all be. If it brings us continued struggle, we shall remain undaunted. He also read an excerpt from the poem God Knows by Minnie Louise Haskins, a professor of sociology and philosophy at the London School of Economics. The Queen's 1953 message was broadcast from Auckland, New Zealand during her 1953-1954 tour of the Commonwealth. She expressed sympathy for the victims of the Tangiwai disaster, New Zealand's worse rail mishap. On Christmas Eve, a bridge had collapsed between an express passenger train at Tangiwai, on the Northern Island of the country. The death toll from the accident was 151. Queen Elizabeth II delivered the first televised Christmas broadcast by a British sovereign in 1957, when she was 31 years old. It was filmed at Sandringham House at Norfolk, England. Here is how the Queen began her message to Britain and the Commonwealth 56 years ago, at a time when television was still fairly new and fresh, especially outside of North America. Happy Christmas. 25 years ago, my grandfather broadcast the first of these messages. Today is another landmark because television has made it possible for many of you to see me in your homes on Christmas Day. My own family often gather round to watch television as they are at this moment, and that is how I imagine you now. I very much hope that this new medium will make my Christmas message more personal and direct. It's inevitable that I should seem a rather remote figure to many of you. A successor to the kings and queens of history; someone whose face may be familiar in newspapers and films but who never really touches your personal lives. But now, at least for a few minutes, I welcome you to the peace of my own home. That it's possible for some of you to see me today, is just another example of the speed at which things are changing all around us. The Queen's 1967 Christmas broadcast was the first to be shown in colour. She spoke of the centennial of Canada's Confederation and her five week tour of the country to celebrate the event. Her 1968 message was filmed at Buckingham Palace and its theme was brotherhood. She talked about civil rights and the assassination of Martin Luther King in April of that year. In 1984, her theme was lessons adults could learn from children.and footage was shown of the christening of her fourth grandchild, Prince Harry. 2002 marked the 50th anniversary of the Royal Christmas Message and Elizabeth II spoke about joy and sadness, reflecting on the loss of both her mother, Queen Elizabeth the Queen Mother, and her sister Princess Margaret, that same year. The Royal Christmas message is prepared well in advance now because it often includes archival footage and new footage. The Queen frequently mentions special events and significant anniversaries. In 1976, she talked of her visit to the United States to mark the bicentennial of England's former colony and she focused on the theme of reconciliation. In 1990, the Queen recalled the celebration of her mother's 90th birthday and through the years, there has been discussion and footage of various royal weddings and christenings. Times have certainly changed since George V delivered the first Royal Christmas Message on radio back in 1932. King George, impressed as he was by the new medium, could never have envisioned that, in addition to radio and television, his granddaughter's speech would be shown over the Internet. 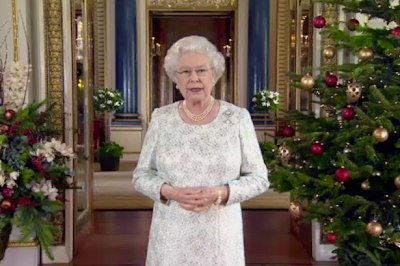 The Queen's Christmas message remains exceedingly popular with British television viewers. According to a recent poll in the United Kingdom, commissioned by Samsung Smart TV, almost a fifth of the people (18%) indicated that the Queen's message was the ultimate in holiday viewing, followed by the Coronation Street special (10%) and the James Stewart film classic, It's A Wonderful Life. Only 3% of those polled chose the Christmas Day Downton Abbey episode. * Sir David Attenborough, British broadcaster and naturalist, produced the first of his six Royal Christmas Messages beginning in 1986 and ending in 1991. * There was no Royal Christmas Message broadcast in December of 1936 because King Edward VIII (Elizabeth II's uncle) abdicated the throne just before Christmas in order to marry Wallis Simpson. Neither was there a Christmas message in 1938 as it was not yet a royal tradition. Another probable reason for the lack of a 1938 message was George VI's. stammer. Making speeches was difficult for him and he was forced to use a slow and deliberate method of delivery in order to fulfill his royal duties. The outbreak of World War II, however, changed everything and the Christmas broadcast became both a necessity and a tradition. * Queen Elizabeth's 1959 Christmas broadcast was pre-recorded as she was pregnant with Prince Andrew. * There was no Christmas broadcast in 1969, the only year during Elizabeth's reign to date that it has not been done. The Queen felt that the Royal Family had had enough exposure on television that year due to the investiture of her son, Prince Charles, as the Prince of Wales and the release of a documentary film entitled Royal Family. Instead, she released a written message and disappointed viewers complained to the BBC. She then felt obliged to reassure a concerned public that the broadcast would return in 1970. Here is the text of her 1969 message. I have received a great number of kind letters and messages of regard and concern about this year's break with the usual broadcast at Christmas and I want you all to know that my good wishes are no less warm and personal because they come to you in a different form. In a short time the 1960s will be over but not out of our memories. Historians will record them as the decade in which men first reached out beyond our own planet and set foot on the moon, but each one of us will have our own special triumphs or tragedies to look back on. My own thoughts are with my older children who are entering the service of the people of this country and the Commonwealth. It is a great satisfaction and comfort to me and my husband to know that they have won a place in your affections. We are all looking forward to our visit to Australia and New Zealand for the Cook Bi-centenary celebrations, and also to Fiji and Tonga. Later next year we hope to see something of the fascinating development of Northern Canada. It is only natural that we should all be dazzled and impressed by the triumphs of technology, but Christmas is a festival of the spirit. At this time our concern is particularly for the lonely, the sick and the elderly. I hope they will all feel the warmth and comfort of companionship and that all of you will enjoy a very happy Christmas with your families and friends. * The Queen's 1975 speech marked the first time the message was recorded outdoors. It was broadcast from the gardens of Buckingham Palace. * In 1998, the Queen's speech appeared on the Internet for the first time. * In 2008, the Queen's Christmas Message was broadcast in high definition. Last year, on December 25, 2012, it was broadcast in 3-D for the first time. * Elizabeth II's annual Christmas broadcasts are written by the Queen herself. Today the message is recorded a few days prior to Christmas and it lasts about 10 minutes, much longer than George V's original speech.